Just an update on the tulip vase. I've added all of the spouts and scrolls and a skirt just above the feet. Not so sure about the top on the photo, could be the angle, as I was really please with it when I left the pottery class. If I still don't like it next week I can still just make another one or two. sorry about the quality it's from my phone as the normal camera ran out of battery ! I love it, can't wait to see it after it has been fired and glazed. 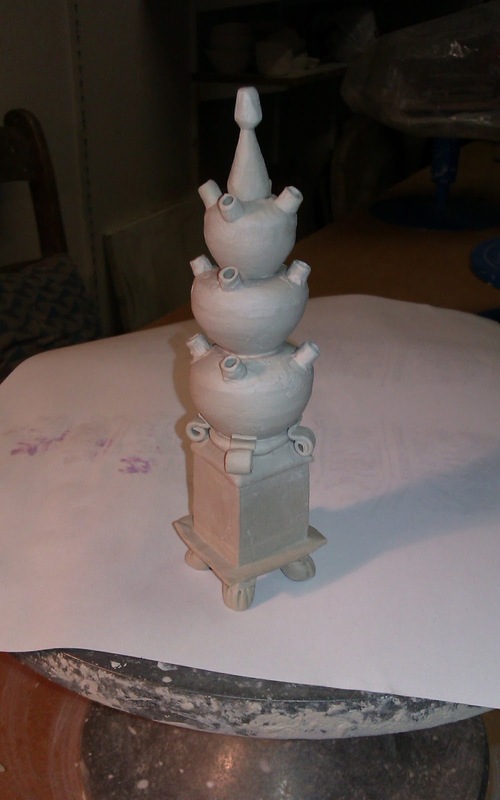 Elga, it will be a blue and white tin glazed vase, so it will take a while. I also have to wait until the kiln is full for earthenware and my small stuff doesn't help all that much in filling it up! Ik vind 'm prachtig! Ben heel benieuwd hoe het er uitziet als het in de oven is geweest. Gee, Dank je wel! Het is al in de oven geweest en ik ben bezig geweest met beschilderen en natuurlijk de camera vergeten!